Metal belts are durable, precise, and offer enhanced capabilities unavailable with other belts. Belt Technologies, Inc. has been producing metal conveyor belts, metal timing belts, and pulleys for new and existing conveyor systems for over 50 years. Using sophisticated technology and innovative manufacturing processes, we are able to provide a countless range of configurations and coatings for custom-designed metal belts, metal timing belts, and metal belt conveyor systems. Our metal belts are used in a variety of industries, including food processing, robotics, solar panel production, medical device manufacturing, semiconductor, automated assembly lines, and more. Optimize automated processes and achieve reliable product quality with complete conveyor systems from Belt Technologies. Leverage the unique properties of stainless steel to achieve long-lasting repeatable results with endless metal belts and drive tapes by Belt Technologies. Discover all of the advantages of stainless steel conveyor belt systems with our downloadable design guide and more. 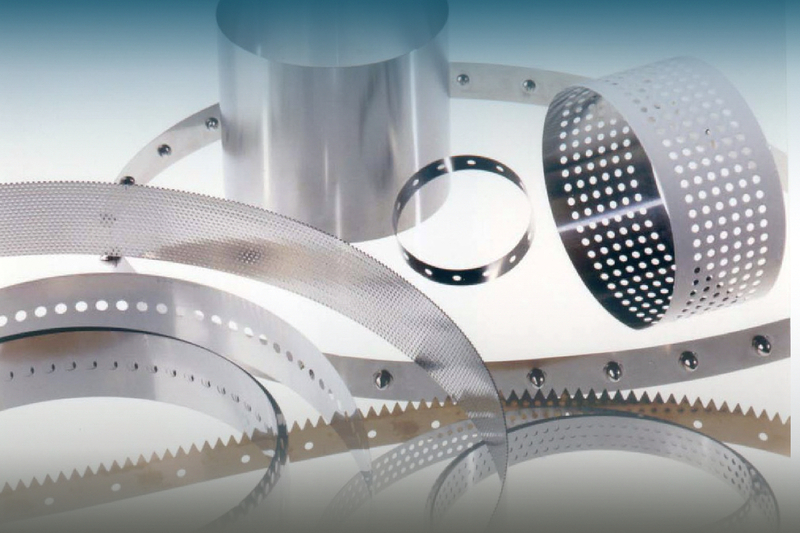 Custom-designed, stainless-steel metal belts, and metal timing belts provide engineers with a wider range of manufacturing options due to the durability, flexibility, and smooth operation that metal belts provide. Our engineers will work with you to design and customize a metal belt configuration for your automated system that is optimized for your facility’s manufacturing needs. With decades of experience, our team can help you convert an existing automated or manual system to a metal belt conveyor operation. We will also work with you to design a new system that will maximize functionality and ensure efficient and cost-effective results. Metal belts have several qualities that make them superior to other belting options. Our metal belts are typically made of stainless steel to ensure longevity and durability under any conditions. Engineers may also choose from a variety of available alloys, which vary in resistance to chemicals, temperatures, and corrosion. Belt material is selected based on the physical demands of the system, availability, and cost. Unlike polyester, nylon, or cotton belts with rubber or plastic covers, metal belts can withstand temperature extremes, vacuum conditions, and hostile, caustic environments. They are not susceptible to long-term wear and tear such as stretching or warping. Metal timing belts, metal conveyor belts, and metal conveyor belt systems offer durability and strength while maintaining a lightweight flexibility for smooth, continuous operation. Metal belts do not generate component friction that would require lubrication and they do not produce particulates or outgassing (as HTD or flat neoprene belts do). It is possible to sterilize them in an autoclave, making metal belts ideal for environments where cleanliness is paramount. Metal belts do not exhibit pulsation, which is often seen in inferior belting materials. This enables precise transmission of the control system’s motion profile. Our metal belts are manufactured for smooth edges and precise dimensions with very tight tolerances to ensure the most accurate and reliable motion possible. We are able to fabricate metal belts with a station-to-station pitch accuracy of ±0.0005”. 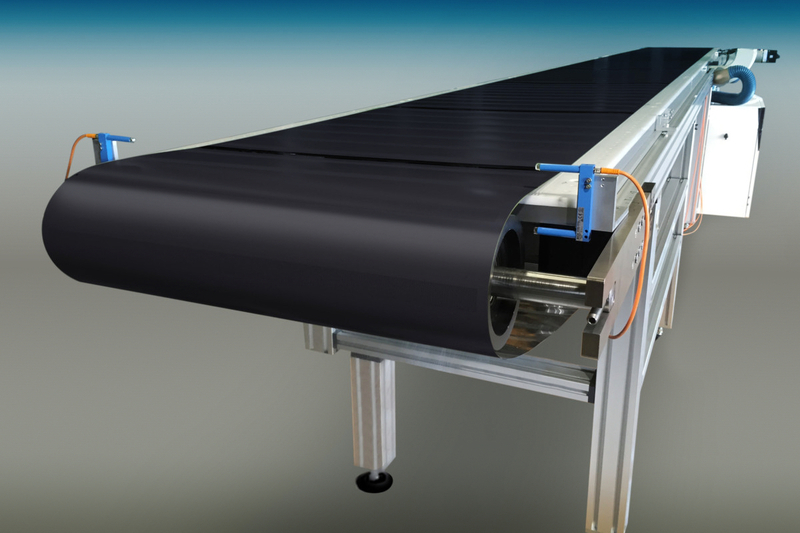 Belt Technologies Metrak V-Guide maximizes belt life with a forced tracking for metal conveyor belt systems. specifications so that your conveyor or automated production system operates reliably and predictably. We are able to produce custom belts with perforations of varying size, shape, and frequency for your robotic or automated operations. Belt Technologies, Inc. provides surface treatments to alter the natural surface properties of the metal belt, tape, or pulley. Treatment options include coating, plating, and bonding. We are able to fulfill any coating request, from basic needs such as silicone and teflon, to more specific options such as gold plating and powdered diamond bonding. Surface thickness can be as little as .0005” and can be uniform or provide pockets for transporting small components. Vacuum belts are metal belts with a precise pattern of perforations that allow air to be pulled through the belt to hold products and materials securely in place as the belt moves. They are ideal for handling delicate objects such as wafers and small robotic components. The use of a vacuum allows items to stay in place on the belt without applying any physical pressure that may damage delicate components. It can also be recalibrated for objects of varying size without replacing any of the fixtures and they are capable of precise positioning control. What can metal belts do for your automation system?